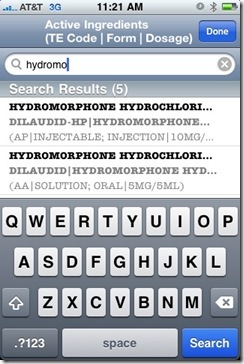 FDA Drugs is an iPhone application that functions as a mobile drug database. 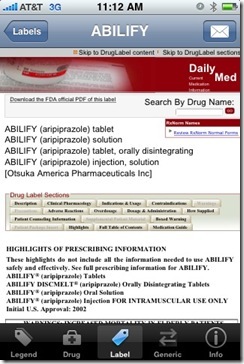 The user selects a drug and the application exposes brand and generic equivalent drug information, with the added twist of being able to display the actual FDA approval document. The name is unfortunate as it implies that the application was developed by the FDA, which it is not. Rather, the developers draw on publicly available FDA data stores to display the label information for thousands of FDA approved prescription and over-the-counter drugs. 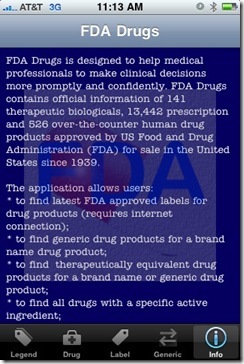 When the label information is not stored inside the application, it displays a NIH website (“Daily Med”) where the user can search for FDA label information. 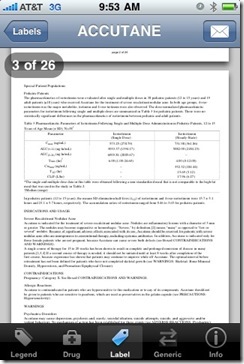 While seeing the original FDA document is of some satisfying curiosity, what is not immediately apparent to this reviewer is the additional benefit this application provides compared to other, more mature drug database applications, such as Epocrates or Medscape. While the ability to quickly look up information on prescription and over-the-counter medications is of great utility for physicians, other mobile applications provide a richer interface to publicly available information when compared to FDA drugs. For example, ePocrates not only provides prescribing information and drug interactions, but goes as far as providing the ability to identify a drug by the shape and color of the pill. These are very useful features for a prescribing physician. Thus, it would seem to this physician that the availability of a publicly available database led to the creation of this application, rather than an identified real user need.